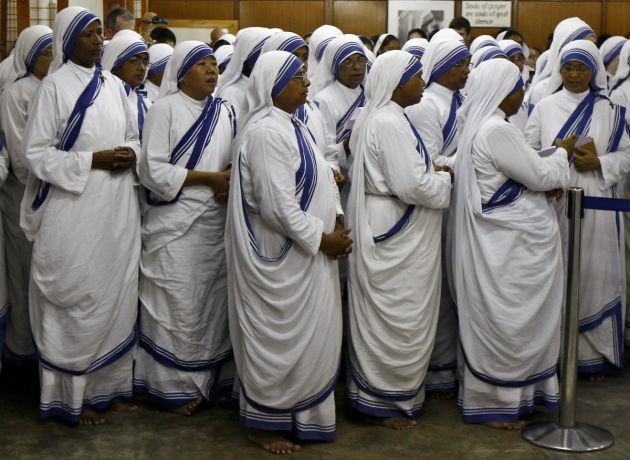 (Photo: REUTERS / Rupak De Chowdhuri)Catholic nuns from the Missionaries of Charity, the global order of nuns founded by Mother Teresa, take part in a mass service to mark the 104th birth anniversary of Mother Teresa in Kolkata August 26, 2014. Teresa, a Nobel Peace Prize winner who died in 1997, was beatified by Pope John Paul II in 2003 at the Vatican. Indian Christians have castigated a Hindu leader for saying that the charity works of the beloved Blessed Teresa of Calcutta, better-known as Mother Teresa, were intended to convert people to Christianity. Some 150 people from different religious backgrounds gathered in Chhattisgarh state to hold a sit-in to protest the remarks Teresa, a nun and Nobel Peace Prize winner acclaimed for her works among the poor and marginalized. They were outraged over the remarks of Mohan Bhagwat, the head of the Rashtriya Swayamsevak Sangh (RSS or National Volunteers Corps), viewed as a hardline Hindu nationalist group made about the nun who worked in India. Bhagwat spoke on Feb. 23 about Mother Teresa's works in India, only to hint the nun seemed to have had an ulterior motive. "Mother Teresa's service would have been good," Bhagwat said. "But it had one objective - to convert the person being served into a Christian," he continued. "If conversion is done in the name of service, then that service gets devalued." Arun Pannalal of the Chhattisgarh Christian Forum, which mobilized the protesters, said the remarks appeared to be in sync with a campaign against the Christian community in India. Minority religions there have faced increased pressure by some Hindus in the past few months, with Christian churches and other places of worship getting vandalized. Some Christians and Muslims have also complained about forced conversions in some parts of the country. "It is a well-planned strategy against the Christian community. Christians all over the world have an image of service to the poor and this is an attempt to destroy that image," Pannalal told ucanews.com. "We are getting strong support. We are soon going to take this protest to the national level," he added. As the protest channeled the rage of people in Chhattisgarh, a Christian group instituted a complaint against Bhagwat at the headquarters of the RSS in Nagpur, western India, demanding an immediate apology. "Bhagwat in his statement is trying to belittle a person who was an icon of hope, [an] icon for the poor and ... of everything that is good in the world. "He needs to apologize to the whole humanity for the remarks he has made," said Sajan George, president of the Global Council of Indian Christians.